Opening with a surprising and riveting action sequence, Confession of Murder (내가 살인범이다) begins in earnest as tough Detective Choi Hyung-gu (Jeong Jae-yeong, 정재영) and serial killer ‘J’ (Jung Hae-Kyun, 정해균) brutally assault each other. Writer/director Jeong Byeong-gil (정병길), who previously released Action Boys (우린 액션배우다) in 2008, captures the kinetic ferocity and its intensity with skill as the two men beat, throw and chase until exhaustion. And then the story begins, and suddenly everything becomes incredibly problematic. Requiring huge leaps in logic for the narrative to remain conceivable, Confession of Murder is best enjoyed as an action movie rather than a thriller. The story is, quite frankly, ludicrous while the tone of the film continually shifts dramatically. The stunt team however have created some highly entertaining and adrenline fueled sequences that are engaging. Unfortunately the plot just doesn’t match the action, progressively becoming worse until a final act which manages to undermine everything about the film. Drinking alone, Detective Choi Hyung-gu is suddenly attacked by ‘J’, a serial killer of 10 women he has been attempting to locate. After a brutal confrontation J stands victorious and, slashing the Detective’s face, runs into the night. Fifteen years later, after the statute of limitations has expired, the murderer appears on television promoting a book which details all of the killings. 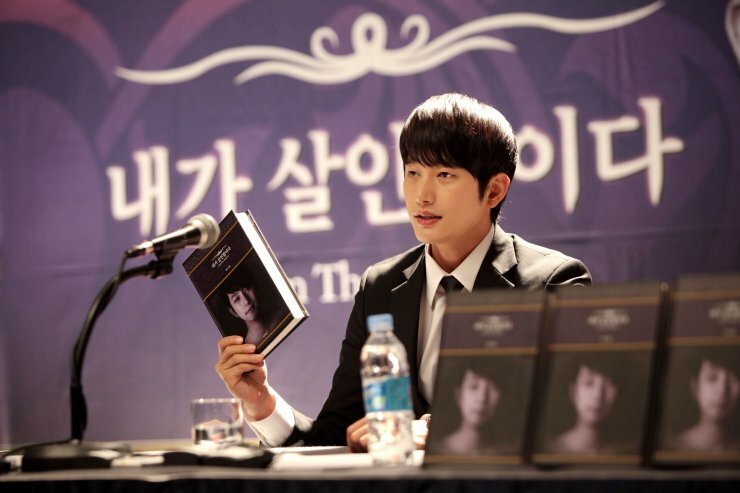 Calling himself Lee Du-seok (Park Si-hoo (박시후), his book ‘I Am A Murderer‘ becomes an instant best-seller, while his boyish good looks earn Du-seok hordes of fans. His popularity does not sit well with the relatives of the victims, however, and while they launch plans Detective Choi investigates the validity of Du-seok’s claims. The stunt team behind Confession of Murder deserve considerable praise for their ingenuity and creativity. Their dynamic, and often quite aggressive, action sequences are the genuine highlight of the film and are thoroughly entertaining. The team also manage to shift the style of action in accordance with the narrative tone, as the sinister and ruthless opening stands in stark contrast to the mad-cap comedy of a later abduction sequence, which is quite a feat. Yet such tonal changes are just one of the many problems that plague the story. Confession of Murder is never really sure what kind of film it wants to be, and by attempting to appease fans of several genres it manages to entertain but not satisfy any. The gritty urban landscapes of the opening are reminiscent of The Chaser, but are eschewed in favor of exploring the notion of celebrity, then later altered again into screwball comedy, before amalgamating them all. In attempting to juggle such disparate forms the depth required for each doesn’t materialise, and the narrative suffers for it. The release of Du-seok’s book ‘I Am A Murderer‘, and his subsequent rise to stardom due to his handsome appearance, provides the potential for biting social satire and criticism that is only ever hinted at. Similarly, the relatives of victims who transpire to capture and kill Du-seok for his crimes evokes themes from Sympathy for Lady Vengeance, but their pain is wholly undermined by their transformation into comical characters. The most glaring oversight is reserved for the manner in which the statute of limitations is explored. While certainly interesting for much of the running time – if disbelief can be suspended – it ultimately becomes quite farcical by the conclusion. Despite such drawbacks, Confession of Murder is entertaining in places. The tension generated between Detective Choi and Du-seok is engaging and continually leaves audiences wondering which of the rivals will outsmart the other and emerge triumphant. As the hard-boiled detective, Jeong Jae-yeong delivers another highly competent performance albeit one that he has played several times before. The role never really stretches Jeong Jae-yeong, and as such he appears quite comfortable throughout rather than a desperate man. His counterpart, Park Si-hoo, is surprisingly effective as Du-seok. The actor has clearly been cast for his handsome features, yet he channels this into a smug arrogance convincingly well. The egotistical grin that adorns his face whenever confronting nemesis Detective Choi is wonderfully sleazy, ramping up the tension between them. For any thriller to leave a lasting impression, however, a certain degree of psychology is required in understanding the motivations of those involved. Director Jeong Byeong-gil realises this far too late, and attempts to flesh out such a back story during the final twenty minutes. This is puzzling to the extreme, as had such scenes transpired during the first act as per tradition, Confession of Murder would have ultimately been a much more engaging film and given incredible impetus to Choi’s mission. Similarly, the murderer clearly sports a host of psychological issues which are barely acknowledged. Instead the finale hinges on masculine prowess, and the highly capable stunt team once again do not disappoint. Confession of Murder is best enjoyed as an action film rather than a thriller due to the wonderfully orchestrated work by the stunt team. While exploring the statute of limitations and notion of celebrity has plenty of potential, writer/director Jeong Byeong-gil ultimately doesn’t assert the required depth – both in narrative and characterisation – due to his attempt to appease fans of multiple genres. An entertaining way to waste a couple of hours, Confession of Murder is a mediocre entry into the thriller canon best enjoyed by fans of the actors involved.